"Besides you, who do I have to kill?" It must have been tough being the high concept guy who was stuck having to come up with something different for each of the long string of musical vehicles for Elvis Presley in the early 1960s. But whoever he was, he really outdid himself with this outlandish little tale of modern-day Arabian Nights. Although it doesn't entirely work (in part due to a leaden effort from the leading man), it still manages significant appeal with its totally outlandish scenario. Action film star Johnny Tyronne (Elvis) is on a goodwill tour of the Middle East when he's kidnapped by a cult of Assassins headed by the sinister Sinan (Theo Marcuse) and the sultry Aishah (Fran Jeffries). Johnny's film exploits and martial arts skills are in demand among the Assassins to kill King Toranshah (Philip Reed) of Lunarkan, a nation that has had no contact with the West in 2000 years. Johnny manages to engineer an escape with the leader of the marketplace thieves guild, the mercenary Zacha (Jay Novello), after briefly meeting the king's daughter, Princess Shalimar (Miss America Mary Ann Mobley) and immediately falling in love with her. But the Assassins aren't done with Elvis just yet, and he finds himself torn between his love and saving his own neck. The proceedings have a definite fairy tale quality to them, occasionally interrupted by Elvis' Americanisms and repeated references to American foreign aid. But this Middle East seems like a fantabulous place dripping with gold and jewels, populated with dancing girls, talented midgets (such as Billy Barty) and magical pools (not to mention an odd ability to speak perfect English, despite having no contact with the West). There's a measure of pro forma barbarity too, of course, but it's all played pretty much tongue in cheek. One scene that feels jarring today is a sexualized (if not fetishized) dance by little Sari (Vicki Malkin), who can't be more than ten years old, while Elvis leers at her. It's creepy beyond belief, but before long things turn back to more wholesome fun. About the only person who doesn't seem to be having a good time is Presley. This was made near the end of his long run of films, and he's clearly just going through the motions here for the most part. The exception comes in the martial arts sequences, where he seems to be getting into the action aspect. Perhaps if the action genre had been more developed in the 1960s he might have followed that course for his film career. Mobley is pretty much just window dressing with a dull look of bewilderment through most of her scenes. Fran Jeffries, on the other hand, oozes sensuality with every move. Novello plays Zacha way over the top and he's plenty of fun to watch, and the same goes for Marcuse, who drips venom with every word. Image Transfer Review: The anamorphic widescreen picture is quite attractive for the most part, with a filmlike appearance. Colors are quite vivid and fine detail is evident throughout (for instance, one can see Elvis had a pretty bad skin condition). On a few shots, there are vertical line artifacts visible on skin tones for some reason, but for the most part they look fine. Shadow detail is excellent and black levels are very good. The source print is in fine condition, with only the occasional speckle marring the viewing experience. Audio Transfer Review: Only a 1.0 audio is included, but it's reasonably good. Dialogue is never a problem, and the music sounds fine and lacks distortion. Bass levels aren't overwhelming but range and depth are better than acceptable. The percussion for some reason sounds particularly realistic on this mix. 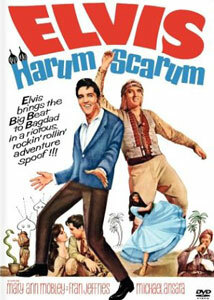 Extras Review: The only extras are a set of five anamorphic widescreen trailers for Elvis films (including this one). Chaptering is adequate. An off-the-wall entry in the Elvis canon, with some good songs and an interesting setting, even if Elvis doesn't seem as if he wants to be bothered. The transfer's quite good but not much for extras.